I'm so passionate about quilting! It's been a lifelong pursuit. New techniques to speed up the process always intrigue me, as do new genres in the quilts themselves. Some days I realize that I know a lot that I have learned from talented people along the way, and as a result, have a lot to share. This is one of those days. 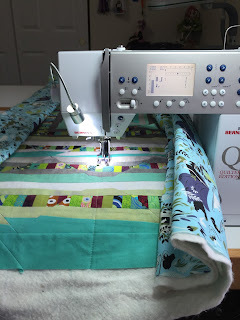 I want to show you some of the steps that I use for basting quilts that will be quilted on my domestic machine. 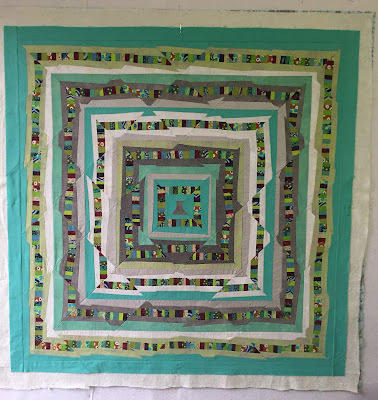 One of the issues with domestic machine quilting is the handling and rolling that creates distortion and wrinkling. First Basting Step. 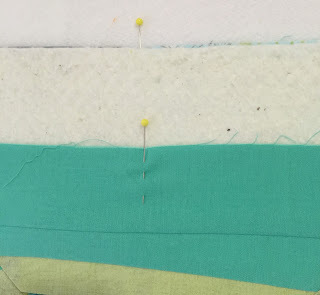 When I'm ready to baste a quilt, I put the backing face down on my design board, marking the centers of the top, bottom and sides. I always add about 2" extra around the edges of the quit top when I size the backing. Then I cut the batting to the same size and lay this on top. The final layer is the quilt, face side up with pins marking the middle of the top, bottom and sides. Here is the quilt ready to be basted, showing the extra batting and backing around the edges. 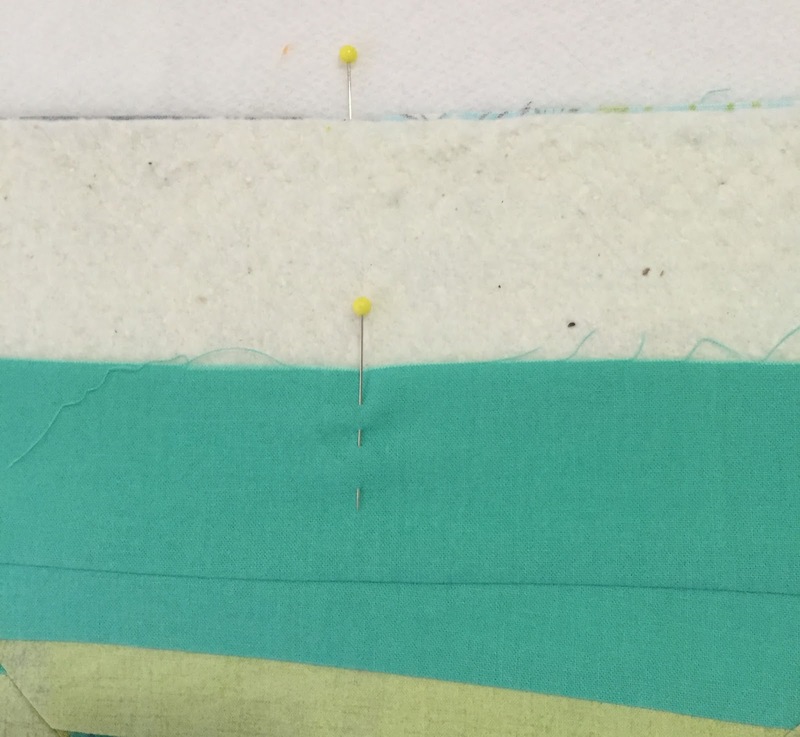 I use pins to get the quilt layers positioned where I want them. When I'm happy with the layers and they're all smoothed out, I place pins across the middle. I also lay newspaper on the floor in front of the quilt so that I don't get the basting spray on the carpet. If you will spray close to the edges, you might also want to put newspaper on your design board. I baste with 505 basting spray from ODIF. It's readily available in quilting and fabric stores. It's a temporary adhesive, which means you can pull up the fabric and re-position it. Just like a post-it note. Using the middle pins as a holder, I lower the top of the quilt and the batting, then spray the batting with the temporary basting spray. I smooth up the batting from the middle up towards the corners. When that is all smooth, I spray it with the basting spray, and then smooth up the quilt top from the middle out towards the corners. 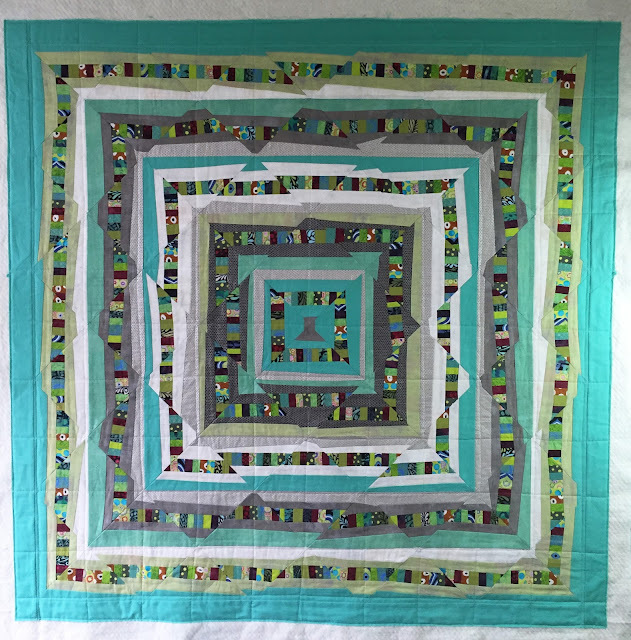 When the top is done, I lift up the bottom quilt and batting and repeat the process. 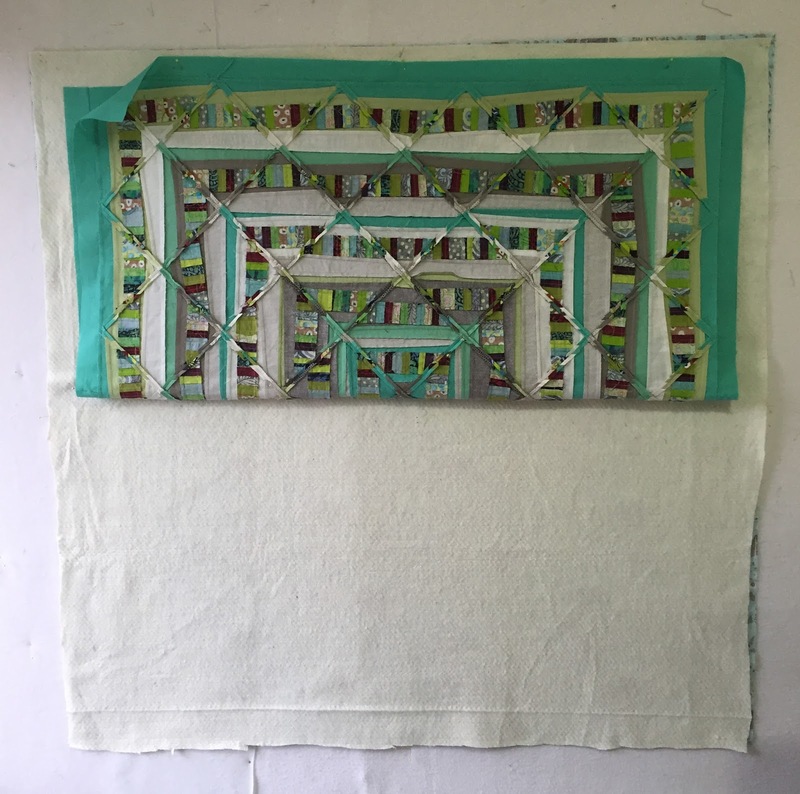 Here is a picture of the quilt ready to spray the bottom half. When the spraying is all done, I remove the quilt package from the wall and let it sit overnight on my table. Second Basting Step. If you are not going to wash your quilt, place safety pins every 4-5 inches to give you a more secure basting. If you are going to wash your quilt, use dissolving thread to do a grid of basting on the machine. 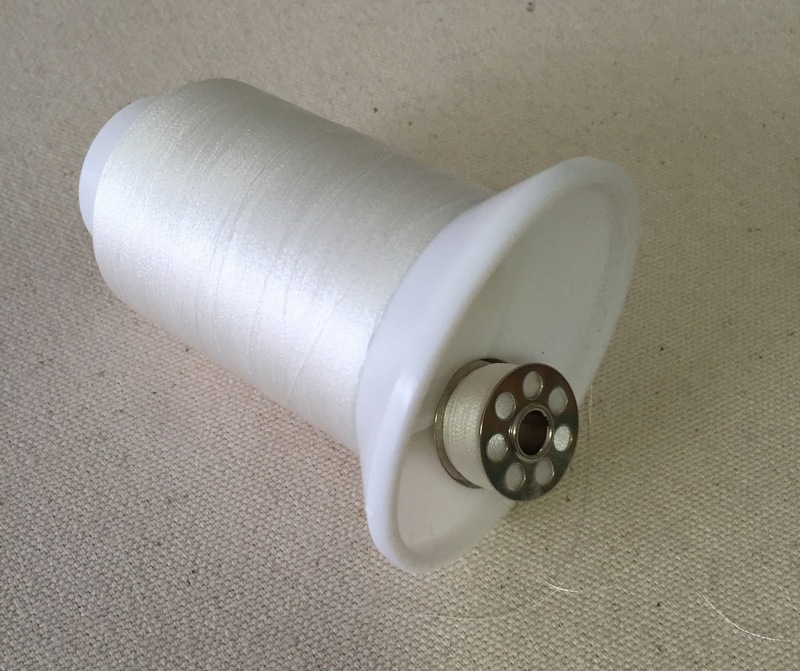 I like to use Vanish Lite from Superior Threads. Wind a separate bobbin with this thread, and make sure to store it with the spool, so that it doesn't get confused with any other thread. 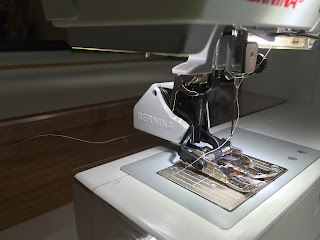 Set your machine to a long stitch length (3.0 mm) and use a walking foot to keep the top and bottom evenly fed through the machine. 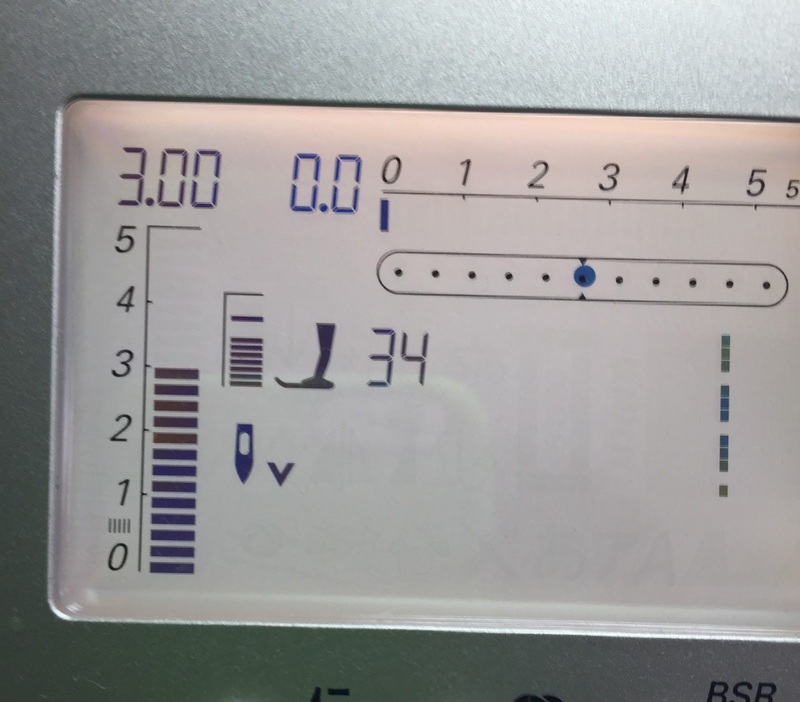 I also lower the tension on the pressure foot so that the machine isn't pushing too hard on all of the layers. 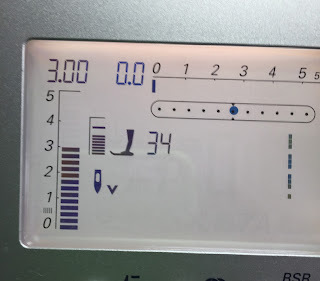 Here is the tension shown at 34 (from the normal 47). Quilt a 4-5" grid, ignoring any pattern lines. Finish this off with stitching on the outside edges. All of this basting will dissolve when you wash your quilt. It is only for basting and is so fast to do that you'll wonder why you haven't done it before. 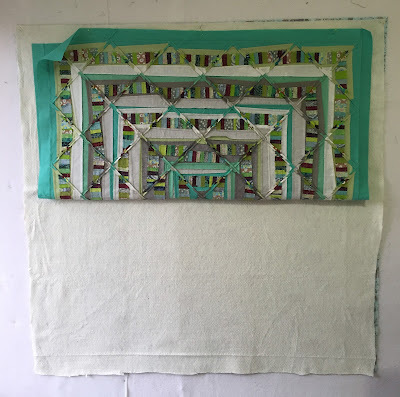 When you do the final quilting, you'll find that the quilt can only move within this grid and with the spray basting, it might not move at all. Good luck when you baste your next quilt!